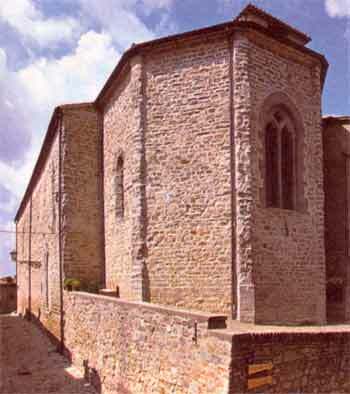 The Church of St. Francis was founded around 1300 and it was placed on the hill where the house of Olivi and the house of Fortebracci were located. It was similar in style and architecture to the edifices built by the Mendicant Orders: linear and simple shapes, an only nave with a polygonal apse and a trussed roof. What remains of the frescoes, which can be dated back to the second half of the 14th century, suggests that a large decorative improvement was made soon after the edification of the church. 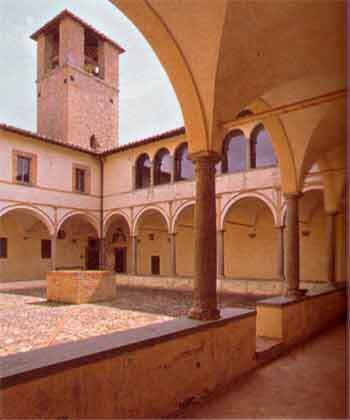 The finest decorative results had been reached in the next century, when the building became the family church of the Fortebracci, which generously contributed to his improvement providing it with altars, furnishings and paintings. The apse is decorated with frescoes, painted between 1423 and 1424 by Antonio Alberti from Ferrara, which represent scenes from the life of St. Francis and scenes of the Last Judgment and were commissioned by Braccio da Montone: he is commemorated with his coat of arms, the ram between two cheetahs, and those of cities he conquered. Carlo, son of Braccio, had the altar on the left wall built in 1476; then, his son Bernardino made it decorated in 1491 with the fresco by Bartolomeo Caporali showing St. Antonio of Padua between John the Baptist and the Archangel Gabriele with Tobiolo (Tobias). The generous contribution of Margherita Malatesta, Carlo’s wife, was the completion of the opposite altar on the right wall, built between 1474 and 1482 and intended to house the gonfalone (banner) realised by Bartolomeo Caporali, which is today preserved in the Museum.